Hank III combined with Jon Spencer, Maybe? Black Sabbath with a slide guitar, I don’t rightly know. 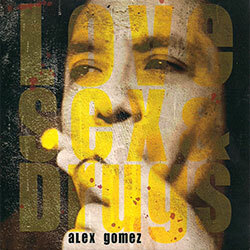 Either way, I have this disc from Alex Gomez. It is chock full of some seriously raw electrified blues. It slides this way and the other. It shreds (speaker cones) a bit. It is raw. I’ll make you throat hoarse if you try to sing along. Honestly I’m not completely sure of what to make of it yet. I’ve had the CD in the car for a while and it seemed to work there when the Mexican radio wasn’t quite up to par. I’m listening to it right now after several blue ribbon awarded adult beverages and it keeps getting better. Let me tell you more though. There are 10 songs. They all sound a bit similar, but once you hook into the loose slide groove, they don’t degrade in quality for the duration. So I’m hangin’ on a sort of fence on this one. I can’t say I’m adding it to heavy rotation, but I’m not going to dismiss it either. You listen. You decide.